DELIVERED ON SUNDAY MORNING, DECEMBER 24TH, 1863, AT THE METROPOLITAN TABERNACLE, NEWINGTON. “AND WHEN THEY HAD SEEN IT, they made known abroad the saying which was told them concerning this child. And all they that heard it wondered at those things which were told them by the shepherds. But Mary kept all these things, and pondered them in her heart. And the shepherds returned, glorifying and praising God for all the things that They had heard and seen, as it was told unto them.” — Luke 2:17-20. ‍EVERY season has its own proper fruit: apples for autumn, holly berries for Christmas. The earth brings forth according to the period of the year, and with man there is a time for every purpose under heaven. At this season, the world is engaged in congratulating itself and in expressing its complimentary wishes for the good of its citizens; let me suggest extra and more solid work for Christians. 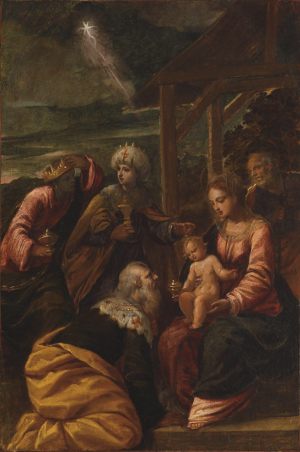 As we think to-day of the birth of the Saviour, let us aspire after a fresh birth of the Saviour in our hearts; that as he is already “formed in us the hope of glory,” we may be “renewed in the spirit of our minds;” that we may go again to the Bethlehem of our spiritual nativity and do our first works, enjoy our first loves, and feast with Jesus as we did in the holy, happy, heavenly days of our espousals. Let us go to Jesus with something of that youthful freshness and excessive delight which was so manifest in us when we looked to him at the first; let him be crowned anew by us, for he is still adorned with the dew of his youth, and remains “the same yesterday, to-day, and forever.” The citizens of Durham, though they dwell not far from the Scotch border, and consequently in the olden times were frequently liable to be attacked, were exempted from the toils of war because there was a cathedral within their walls, and they were set aside to the bishop’s service, being called in the olden times by the name of “holy work-folk.” Now, we citizens of the New Jerusalem, having the Lord Jesus in our midst, may well excuse ourselves from the ordinary ways of celebrating this season; and considering ourselves to be “holy work-folk,” we may keep it after a different sort from other men, in holy contemplation and in blessed service of that gracious God whose unspeakable gift the new-born King is to us. I selected this text this morning because it seemed to indicate to me four ways of serving God, four methods of executing holy work and exercising Christian thought. Each of the verses sets before us a different way of sacred service. Some, it appears, published abroad the news, told to others what they had seen and heard; some wondered with a holy marvelling and astonishment; one, at least, according to the third of the verses, pondered, meditated, thought upon these things; and others, in the fourth p1 ace, glorified God and gave him praise. I know not which of these four did God best service, but I think if we could combine all these mental emotions and outward exercises, we should be sure to praise God after a most godly and acceptable fashion. I. To begin then, in the first place, we find that some celebrated the Savior’s birth by PUBLISHING ABROAD what they had heard and seen; and truly we may say of them that they had something to rehearse in men s ears well worth the telling. That for which prophets and kings had waited long, had at last arrived and arrived to them. They had found out the answer to the perpetual riddle. They might have run through the streets with the ancient philosopher, crying, “Eureka! Eureka!” for their discovery was far superior to his. They had found out no solution to a mechanical problem or metaphysical dilemma, but their discovery was second to none ever made by men in real value, since it has been like the leaves of the tree of life to heal the nations, and a river of water of life to make glad the city of God. They had seen angels; they had heard them sing a song all strange and new. They had seen more than angels,- they had beheld the angel’s King, the Angel of the Covenant whom we delight in. They had heard the music of heaven, and when near that manger the ear of their faith had heard the music of earth’s hope, a mystic harmony which should ring all down the ages,-the grave sweet melody of hearts attuned to praise the Lord, and the glorious swell of the holy joy of God and man rejoicing in glad accord. They had seen God incarnate,-such a sight that he who gazeth on it must feel his tongue unloosed, unless indeed an unspeakable astonishment should make him dumb. Be silent when their eyes had seen such a vision! Impossible! To the first person they met outside that lowly stable door they began to tell their matchless tale, and they wearied not till nightfall, crying, “Come and worship! Come and worship Christ, the new-born King!” As for us, beloved, have we also not something to relate which demands utterance? If we talk of Jesus, who can blame us? This, indeed, might make the tongue of him that sleeps to move,- the mystery of God incarnate for our sake, bleeding and dying that we might neither bleed nor die, descending that we might ascend, and wrapped in swaddling bands that we might be unwrapped of the grave- clothes of corruption. Here is such a story, so profitable to all hearers that he who repeats it the most often does best, and he who speaks the least hath most reason to accuse himself for sinful silence. They had something to tell, and that something had in it the inimitable blending which is the secret sign and royal mar/c of Divine authorship; a peerless marrying of sublimity and simplicity; angels singing!-singing to shepherds! Heaven bright with glory! Bright at midnight! God! A Babe!! The Infinite! An Infant of a span long!! The Ancient of Days! Born of a woman!! What more simple than the inn, the manger, a carpenter, a carpenter’s wife, a child? What more sublime than a “multitude of the heavenly host” waking the midnight with their joyous chorales, and God himself in human flesh made manifest. A child is but an ordinary sight; but what a marvel to see that Word which was “in the beginning with God, tabernacling among us that we might behold his glory-the glory as of the only begotten of the Father, full of grace and truth?” Brethren, we have a tale to tell, as simple as sublime. What simpler?-” Believe and live.” What more sublime?- was in Christ reconciling the world unto himself!” A system of salvation so wonderful that angelic minds cannot but adore as they meditate upon it; and yet so simple that the children in the temple may fitly hymn its virtues as they sing. “Hosanna! Blessed is he that cometh in the name of the Lord.” What a splendid combining of the sublime and the simple have we in the great atonement offered by the incarnate Saviour! Oh make known to all men this saving truth! 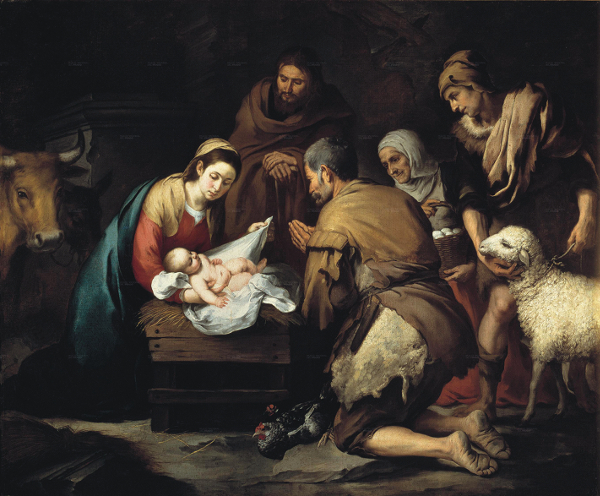 The shepherds need no excuse for making everywhere the announcement of the Savior’s birth, for what they told they first received from heaven. Their news was not muttered in their ears by Sibylline oracles [i.e. Prophetic utterances by High priest], not brought to light by philosophic search, not conceived in poetry nor found as treasure trove among the volumes of the ancient; but it was revealed to them by that notable gospel preacher who led the angelic host, and testified, “Unto you is born this day, in the city of David, a Saviour, which is Christ the Lord.” When heaven entrusts a man with a merciful revelation, he is bound to deliver the good tidings to others. What, keep that a secret whose utterance eternal mercy makes to charm the midnight air? To what purpose were angels sent, if the message were not to be spread abroad? According to the teaching of our own beloved Lord we must not be silent, for he bids us “What ye bear in secret that reveal ye in public; and what I tell you in the ear in closets, that proclaim ye upon the house-tops.” Beloved, you have heard a voice from heaven-you twice-born men, begotten again unto a lively hope, you have heard the Spirit of God bearing witness of God’s truth with you, and teaching you of heavenly things. You then must keep this Christmas by telling to your fellow-men what God’s own holy Spirit has seen fit to reveal to you. ‍But though the shepherds told what they heard from heaven. Remember that they spoke of what they had seen below. They had, by observation, made those truths most surely their own which had first been spoken to them by revelation. No man can speak of the things of God with any success until the doctrine which he finds in the book he finds also in his heart. We must bring down the mystery and make it plain, by knowing, by the teaching of the Holy Ghost, its practical power on the heart and conscience. My brethren, the gospel which we preach is most surely revealed to us by the Lord; but, moreover, our hearts have tried and proved, have grasped, have felt, have realized its truth and power. If we have not been able to understand its heights and depths, yet we have felt its mystic power upon our heart and spirit. It has revealed sin to us better; it has revealed to us our pardon. It has killed the reigning power of sin, it has given us Christ to reign over us, the Holy Spirit to dwell within our bodies as in a temple. Now we must speak. I do not urge any of you to speak of Jesus who merely know the Word as you find it in the Bible, your teaching can have but little power; but I do speak earnestly to you who know its mighty influence upon the heart, who have not only heard of the babe but have seen him in the manger, taken him up in your own arms and received him as being born to you, a Saviour to you, Christos, the anointed for you, Jesus the Saviour from sin for you. Beloved, can you do otherwise than speak of the things which you have seen and heard. God has made you to taste and to handle of this good word of life, and you must not, you dare not hold your peace, but you must tell to friends and neighbours what you have felt within. These were shepherds, unlettered men. I will warrant you they could not read in a book; there is no probability that they even knew a single letter. They were shepherds, but they preached right well; and, my brethren, whatever some may think, preaching is not to be confined to those learned gentlemen who have taken their degrees at Oxford or at Cambridge, or at any College or University, It is true that learning need not be an impediment to grace, and may be a fitting weapon in a gracious hand, but often the grace of God has glorified itself by the plain clear way in which unlettered men have understood the gospel and have proclaimed it. I would not mind asking the whole world to find a Master of Arts now living who has brought more souls to Christ Jesus than Richard Weaver. If the whole bench of bishops have done a tenth as much in the way of soul-winning as that one man, it is more than most of us give them credit for. Let us give to our God all the glory, but still let us not deny the fact that this sinner saved, with the brogue of the collier still about him, fresh from the coal pit, tells the story of the cross by God’s grace in such a way that Right Reverend Fathers in God might humbly sit at his feet to learn the way to reach the heart and melt the stubborn soul. It is true an uneducated brother is not fitted for all work-he has his own sphere-but he is quite able to tell of what he has seen and heard, and so it strikes me is every man in a measure. If you have seen Jesus and heard his saving voice, if you have received truth as from the Lord, felt its tremendous power as coming from God to you, and if you have experienced its might upon your own spirit, why you can surely tell out what God has written within. If you cannot get beyond that into the deeper mysteries, into the more knotty points, well, well, there are some who can, and so you need not be uneasy; but you can at least reveal the first and foundation truths, and they are by far the most important. If you cannot speak in the pulpit, if as yet your cheek would mantle with a blush, and your tongue would refuse to do her office in the presence of many, there are your children, you are not ashamed to speak before them; there is the little cluster round the hearth on Christmas night, there is the little congregation in the workshop, there is a little audience somewhere to whom you might tell out of Jesus’ love to lost ones. Do not get beyond what you know; do not plunge into what you have not experienced, for if you do you will be out of your depth, and then very soon you will be floundering and making confusion worse confounded. Go as far as you know; and since you do know yourself a sinner and Jesus a Savior, and a great one too, talk about those two matters, and good will come of it. Beloved, each one in his own position, tell what you have heard and seen; publish that abroad among the sons of men. ‍II. We set before you, now, another mode of keeping Christmas, by HOLY WONDER, ADMIRATION, AND ADORATION. “And all they that heard it wondered at those things which were told them by the shepherds.” We shall have little to say of those persons who merely wondered, and did nothing more. Many are set a wondering by the Gospel. They are content to hear it, pleased to hear it; if not in itself something new, yet there are new ways of putting it, and they are glad to be refreshed with the variety. The preacher’s voice is unto them as the sound of one that giveth a goodly tune upon an instrument. They are glad to listen. They are not sceptics, they do not cavil, they raise no difficulties; they just say to themselves, “It is an excellent gospel, it is a wonderful plan of salvation. Here is most astonishing love, most extraordinary condescension.” Sometimes they marvel that these things should be told them by shepherds; they can hardly understand how unlearned and ignorant men should speak of these things, and how such things should ever get into these shepherds’ heads, where they can have learned them, how it is that they seem so earnest about them, what kind of operation they must have passed through to be able to speak as they do. But after holding up their hands and opening their mouths for about nine days, the wonder subsides, and they go their way and think no more about it. There are many of you who are set a wondering whenever you see a work of God in your district. You hear of somebody converted who was a very extraordinary sinner, and you say, “It is very wonderful!” There is a revival; you happen to be present at one of the meetings when the Spirit .of God is working gloriously: you say, “Well, this is a singular thing! Very astonishing!” Even the newspapers can afford a corner at times for very great and extraordinary works of God the Holy Spirit; but there all emotion ends; it is all wondering, and nothing more. Now, I trust it will not be so with any of us; that we shall not think of the Savior and of the doctrines of the gospel which he came to preach simply with amazement and astonishment, for this will work us but little good. On the other hand, there is another mode of wondering which is akin to adoration, if it be not adoration. I think it would be very difficult to draw a line between holy wonder and real worship, for when the soul is overwhelmed with the majesty of God’s glory, though it may not express itself in song, or even utter its voice with bowed head in humble prayer, yet it silently adores. I am inclined to think that the astonishment which sometimes seizes upon the human intellect at the remembrance of God’s greatness and goodness is, perhaps, the purest form of adoration which ever rises from mortal men to the throne of the Most High. This kind of wonder I recommend to those of you who from the quietness and solitariness of your lives are scarcely able to imitate the shepherds in telling out the tale to others: you can at least fill up the circle of the worshippers before the throne by wondering at what God has done. Let me suggest to you that holy wonder at what God has done should be very natural to you. That God should consider his fallen creature, man, and instead of sweeping him away with the besom of destruction should devise a wonderful scheme for his redemption, and that he should himself undertake to be man’s Redeemer, and to pay his ransom price, is, indeed, marvellous! Probably it is most marvellous to you in its relation to yourself, that you should be redeemed by blood; that God should forsake the thrones and royalties above to suffer ignominiously below for you. If you know yourself you can never see any adequate motive or reason in your own flesh for such a deed as this. “Why such love to me?” you will say. If David sitting in his house could only say, “Who am I, 0 Lord God, and what is mine house, that thou hast brought me hitherto?” what should you and I say? Had we been the most meritorious of individuals, and had unceasingly kept the Lord’s commands, we could not have deserved such a priceless boon as incarnation; but sinners, offenders, who revolted and went from God, further and further, what shall we say of this incarnate God dying for us, but “Herein is love, not that we loved God but that God loved us.” Let your soul lose itself in wonder, for wonder, dear friends, is in this way a very practical emotion. Holy wonder will lead you to grateful worship; being astonished at what God has done, you will pour out your soul with astonishment at the foot of the golden throne with the song, “Blessing, and honour, and glory, and majesty, and power, and dominion, and might be unto Him who sitteth on the throne and doeth these great things to me.” Filled with this wonder it will cause you a godly watchfulness; you will be afraid to sin against such love as this. Feeling the presence of the mighty God in the gift of his dear Son, you will put off your shoes from off your feet, because the place where on you stand is holy ground. You will be moved at the same time to a glorious hope. If Jesus has given himself to you, if he has done this marvellous thing on your behalf, you will feel that heaven itself is not too great for your expectation, and that the rivers of pleasure at God’s right hand are not too sweet or too deep for you to drink thereof. Who can be astonished at anything when he has once been astonished at the manger and the cross? What is there wonderful left after one has seen the Savior? The nine wonders of the world! Why, you may put them all into a nutshell-machinery and modern art can excel them all; but this one wonder is not the wonder of earth only, but of heaven and earth, and even hell itself. It is not the wonder of the olden time, but the wonder of all time and the wonder of eternity. They who see human wonders a few times, at last cease to be astonished; the noblest pile that architect ever raised, at last fails to impress the onlooker; but not so this marvellous temple of incarnate Deity; the more we look the more we are astonished, the more we become accustomed to it, the more have we a sense of its surpassing splendour of love and grace. There is more of God, let us say, to be seen in the manger and the cross, than in the sparkling stars above, the rolling deep below, the towering mountain, the teeming valleys, the abodes of life, or the abyss of death. Let us then spend some choice hours of this festive season in holy wonder, such as will produce gratitude, worship, love, and confidence. ‍III. A third manner of holy work, namely, HER SACRED HEART PONDERING AND PRESERVING, you will find in the next verse. One at least, and let us hope there were others, or at any rate let us ourselves be others-one kept all these things and pondered them in her heart. She wondered: she did more- she pondered. You will observe there was an exercise on the part of this blessed woman of the three great parts of her being; her memory-she kept all these things; her affections- she kept them in her heart; her intellect-she pondered them, considered them, weighed them, turned them over; so that memory, affection, and understanding, were all exercised about these things. We delight to see this in Mary, but we are not at all surprised when we recollect that she was in some sense the most concerned of all on earth, for it was of her that Jesus Christ had been born. Those who come nearest to Jesus and enter the most closely into fellowship with him, will be sure to be the most engrossed with him. Certain persons are best esteemed at a distance, but not the Savior; when you shall have known him to the very full, then shall you love him with the love which passeth knowledge; you shall comprehend the heights, and depths, and lengths, and breadths of his love; and when you shall do so, then your own love shall swell beyond all length and breadth, all height and depth. The birth most concerned Mary, and therefore she was the most impressed with it. Note the way in which her concern was shown; she was a woman, and the grace which shines best in the female is not boldness-that belongs to the masculine mind; but affectionate modesty is a feminine beauty, and hence we do not read so much of her telling abroad as pondering within. No doubt she had her circle, and her word to speak in it; but for the most part she, like another Mary, sat still in the house. She worked, but her work was most directly for him, her heart’s joy and delight. Like other children, the holy child needed care, which only a mother’s hand and heart could exercise; she was therefore engrossed with him. 0 blessed engrossment Sweet engagement! Count not that to be unacceptable service which occupies itself rather with Jesus than with his disciples or his wandering sheep. That woman who broke the alabaster box and poured the ointment upon our Jesus himself was blamed by Judas, and even the rest of the disciples thought that the poor had lost a benefit, but “she hath wrought a good work on me” was the Savior’s answer. I desire to bring you to this thought, that if during this season you retiring quiet ones cannot speak to others, or have no desirable opportunity or suitable gift for that work, you may sit still with Jesus and honour him in peace. 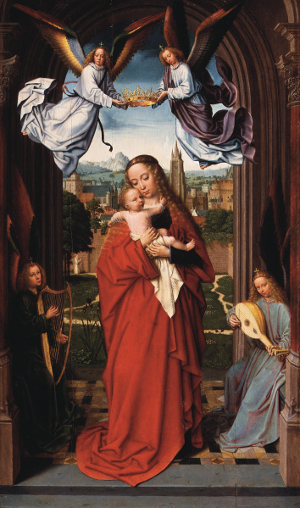 Mary took the Lord in her arms; oh that you may bear him in yours! She executed works for his person directly; do you imitate her. You can love him, bless him, praise him, study him, ponder him, comprehend his character, study the types that set him forth, and imitate his life; and in this way, though your worship will not blaze forth among the sons of men, and scarcely benefit them as some other forms of work, yet it will both benefit you and be acceptable to your Lord. Beloved, remember what you have heard of Christ, and what he has done for you; make your heart the golden cup to hold the rich recollections of his past loving- kindness; make it a pot of manna to preserve the heavenly bread whereon saints have fed in days gone by. Let your memory treasure up everything about Christ which you have either heard, or felt, or known, and then let your fond affections hold him fast evermore. Love him! Pour out that alabaster box of your heart, and let all the precious ointment of your affection come streaming on his feet. If you cannot do it with joy do it sorrowfully, wash his feet with tears, wipe them with the hairs of your head; but do love him, love the blessed Son of God, your ever tender Friend. Let your intellect be exercised concerning the Lord Jesus. Turn over and over by meditation what you read. Do not be loiter men — do not stop at the surface; dive into the depths. Be not as the swallow which toucheth the brook with her wing, but as the fish which penetrates the lowest wave. Drink deep draughts of love; do not sip and away, but dwell at the well as Isaac did at the well Lahai-roi. Abide with your Lord: let him not be to you as a wayfaring man that tarrieth for a night, but constrain him, saying, “Abide with us, for the day is far spent.” hold him, and do not let him go. The word “ponder,” as you know, means to weigh. Make ready the scales of judgment. Oh, but where are the scales that can weigh the Lord Christ? “He taketh up the isles as a very little thing “-who shall take him up? “He weigheth the mountains in scales.” In what scales shall we weigh him? Be it so, if your understanding cannot comprehend, let your affections apprehend; and if your spirit cannot compass the Lord Jesus in the arms of its understanding, let it embrace him in the arms of your affection. Oh, beloved, here is blessed Christmas work for you, if, like Mary, you lay up all these things in your heart and ponder upon them. IV. The last piece of holy Christmas work is to come. “The shepherds returned,” we read in the twentieth verse, “GLORIFYING AND PRAISING GOD for all the things that they had heard and seen, as it was told unto them.” Returned to what? Returned to business to look after the lambs and sheep again. Then if we desire to glorify God we need not give up our business. Some people get the notion into their heads that the only way in which they can live for God is by becoming ministers, missionaries, or Bible women. Alas! How many of us would be shut out from any opportunity of magnifying the Most High if this were the case. The shepherds went back to the sheep-pens glorifying and praising God. Beloved, it is not office, it is earnestness; it is not position, it is grace which will enable us to glorify God. God is most surely glorified in that cobbler’s stall where the godly worker as he plies the awl sings of the Savior’s love, ay, glorified far more than in many a prebendal stall where official religiousness performs its scanty duties. The name of Jesus is glorified by yonder carter as he drives his horse and blesses his God, or speaks to his fellow labourer by the roadside as much as by yonder divine who, throughout the country like Boanerges [i.e. a fiery preacher like James and John, c.f. Mark 3:17], is thundering out the gospel. God is glorified by our abiding in our vocation. Take care you do not fall out of the path of duty by leaving your calling, and take care you do not dishonour your profession while in it; think not much of yourselves, but do not think too little of your callings. There is no trade which is not sanctified by the gospel. If you turn to the Bible, you will find the most menial forms of labour have been in some way or other connected either with the most daring deeds of faith, or else with persons whose lives have been otherwise illustrious; keep to your calling, brother, keep to your calling! Whatever God has made thee, when he calls thee abide in that, unless thou art quite sure, mind that, unless thou art quite sure that he calls thee to something else. 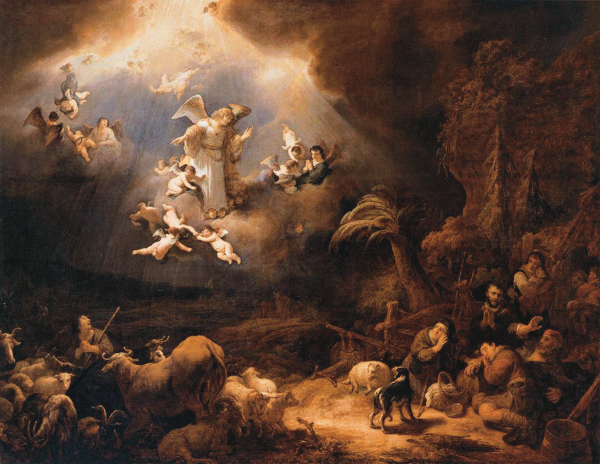 The shepherds glorified God though they went to their trade. They glorified God though they were shepherds. As we remarked, they were not men of learning. So far from having an extensive library full of books, it is probable they could not read a word; yet they glorified God. This takes away all excuse for you good people who say, “I am no scholar; I never had any education, I never went even to a Sunday-school.” Ah, but if your heart is right, you can glorify God. Never mind, Sarah, do not be cast down because you know so little; learn more if you can, but make good use of what you do know. Never mind, John; it is indeed a pity that you should have had to toil so early, as not to have acquired even the rudiments of knowledge; but do not think that you cannot glorify God. If you would praise God, live a holy life; you can do that by his grace, at any rate, without scholarship. If thou wouldst do good to others, be good thyself; and that is a way which is as open to the most illiterate as it is to the best taught. Be of good courage! Shepherds glorified God, and so may you. Remember there is one thing in which they had a preference over the wise men. 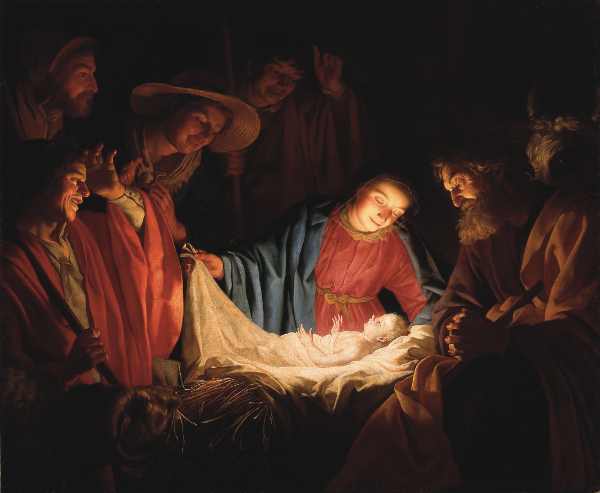 The wise men wanted a star to lead them; the shepherds did not. The wise men went wrong even with a star, stumbled into Jerusalem; the shepherds went straight away to Bethlehem. Simple minds sometimes find a glorified Christ where learned heads, much puzzled with their lore, miss him. A good doctor used to say, “Lo, these simpletons have entered into the kingdom, while we learned men have been fumbling for the latch.” It is often so; and so, ye simple minds, be ye comforted and glad. ‍The way in which these shepherds honoured God is worth noticing. They did it by praising him. Let us think more of sacred song than we sometimes do. When the song is bursting in full chorus from the thousands in this house, it is but a noise in the ear of some men; but inasmuch as many true hearts, touched with the love of Jesus, are keeping pace with their tongues, it is not a mere noise in God’s esteem, there is a sweet music in it that makes glad his ear. What is the great ultimatum of all Christian effort? When I stood here the other morning preaching the gospel, my mind was fully exercised with the winning of souls, but I seemed while preaching to get beyond that. I thought, Well, that is not the chief end after all-the chief end is to glorify God, and even the saving of sinners is sought by the right-minded as the means to that end. Then it struck me all of a sudden, “If in psalm singing and hymn singing we do really glorify God, we are doing more than in the preaching; because we are not then in the means, we are close upon the great end itself.” If we praise God with heart and tongue we glorify him in the surest possible manner, we are really glorifying him then. “Whoso offereth praise glorifieth me,” saith the Lord. Sing then, my brethren! Sing not only when you are together but sing alone. Cheer your labour with psalms, and hymns, and spiritual songs. Make glad the family with sacred music. We sing too little, I am sure, yet the revival of religion has always been attended with the revival of Christian psalmody. Luther’s translations of the psalms were of as much service as Luther’s discussions and controversies; and the hymns of Charles Wesley, and Cennick and Toplady and Newton and Cowper, aided as much in the quickening of spiritual life in England as the preaching of John Wesley and George Whitefield. We want more singing. Sing more and murmur less, sing more and slander less, sing more and cavil less, sing more and mourn less. God grant us to-day, as these shepherds did, to glorify God by praising him. I have not quite done with them. What was the subject of their praise? It appears that they praised God for what they had heard. If we think of it, there is good reason for blessing God every time we hear a gospel sermon. What would souls in hell give if they could hear the gospel once more, and be on terms in which salvation grace might come to them? What would dying men give whose tune is all but over if they could once more come to the house of God, and have another warning and another invitation? My brethren, what would you give sometimes when you are shut up by sickness and cannot meet with the great congregation, when your heart and your flesh cry out for the living God? Well, praise God for what you have heard. You have heard the faults of the preacher; let him mourn them. You have heard his Master’s message. Do you bless God for that? Scarcely will you ever hear a sermon which may not make you sing if you are in a right mind. George Herbert says, “Praying is the end of preaching.” So it is, but praising is its end too. Praise God that you hear there is a Savior! Praise God that you hear that the plain of salvation is very simple! Praise God that you have a Savior for your own soul! Praise God that you are pardoned, that you are saved! Praise him for what you have heard, but observe, they also praised God for what they had seen. Look at the twentieth verse-” heard and seen.” There is the sweetest music-what we have experienced, what we have felt within, what we have made our own-the things that we have made touching the King. Mere hearing may make some music, but the soul of song must come from seeing with the eye of faith. And, dear friends, you who have seen with that God-giving eyesight, I pray you, let not your tongues be steeped in sinful silence, but loud to the praise of sovereign grace, wake up your glory and awake psaltery and harp. One point for which they praised God was the agreement between what they had heard and what they had seen. Observe the last sentence. “As it was told them.” Have you not found the gospel to be in yourselves just what the Bible said it would be? Jesus said he would give you grace -have you not had it? He promised you rest-have you not received it? He said that you should have joy, and comfort, and life through believing in him-have you not had all these? Are not his ways - ways of pleasantness, and his paths - paths of peace? Surely you can say with the queen of Sheba, “The half has not been told me.” I have found Christ more sweet than his servants could set him forth as being. I looked upon the likeness as they painted it, but it was a mere daub us compared with himself- the King in his beauty. I have heard of the goodly land, but oh! It floweth with milk and honey more richly and sweetly than men were ever able to tell me when in their best trim for speech. Surely, what we have seen keeps pace with what we have heard. Let us then glorify and praise God for what he has done. This word to those who are not yet converted, and I have done. I do not think you can begin at the seventeenth verse, but I wish you would begin at the eighteenth. You cannot begin at the seventeenth- y u cannot tell to others what you have not felt; do not try it. Neither t each in the Sunday- school, nor attempt to preach if you are not converted. Unto the wicked God saith, “What hast thou to do to declare my statutes?” But I would to God you would begin with the eighteenth verse — wondering! Wondering that you are spared- wondering that you are out of hell- wondering that still doth his good Spirit strive with the chief of sinners. Wonder that this morning the gospel should have a word for you after all your rejections of it and sins against God. I should like you to begin there, because then I should have good hope that you would go on to the next verse and change the first letter, and so go from wondering to pondering. Oh sinner, I wish you would ponder the doctrines of the cross. Think of thy sin, God’s wrath, judgment, hell, thy Savior’s blood, God’s love, forgiveness, acceptance, heaven — think on these things. Go from wondering to pondering. And then I would to God thou couldst go on to the next verse, from pondering to glorifying. Take Christ, look to him, trust him. Then sing “I am forgiven,” and go thy way a believing sinner, and therefore a sinner saved, washed in the blood, and clean. Then go back after that to the seventeenth verse, and begin to tell to others. Then when the day is over get up to your chambers and wonder, admire and adore; spend half an hour also like Mary in pondering and treasuring up the day’s work and the day’s hearing in your hearts, and then close all with that which never must close-go on to- night, to-morrow, and all the days of your life, glorifying and praising God for all the things that you have seen and heard. May the Master bless you for Jesus Christ’s sake. Amen.